The red figure is a square. 1. Why is the magenta space a square? 2. Write an expression for the area of the magenta square in terms of c.
Continue down after answering #1 and #2. Move the blue point where you like. Think of the triangles covering some of the area of the red square and the magenta square covering the rest. 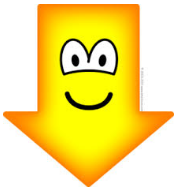 Transform the triangles by moving the Transform slider to the right. 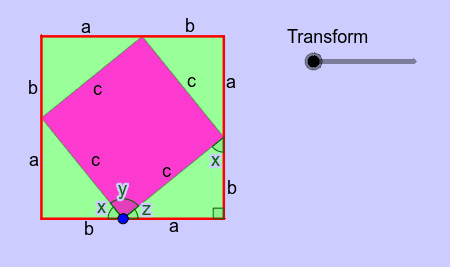 The magenta space now appears as two squares, but the total area is the same as the area of the original magenta square before the transformation. 3. 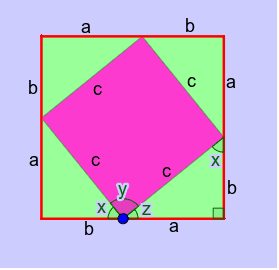 Write an expression for the area of the upper magenta square in terms of a. 4. Write an expression for the area of the lower magenta square in terms of b. 5. Write an expression for the total area of the magenta space in terms of a and b. 6. Now, set your expressions for the area of the magenta space from #2 and #5 equal to each other. 7. The Pythagorean Theorem states that the side lengths of a right triangle are related by the equation a2 + b2 = c2, where a and b are legs and c is the hypotenuse. Did this inductive reasoning activity help convince you about the truth of the Pythagorean Theorem? Explain. This worksheet was inspired by the applet "Visual Proof of Pythagorean Theorem" by Stephen Kent Stephenson at sks23@cornell.edu . Numbers : Greater Than or Less Than ?